Chinese Medicine offers western holistic medical practitioners a wonderful way to explore health and vitality. 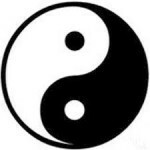 At its simplest level, Chinese Medicine is focused on balancing Yin and Yang. 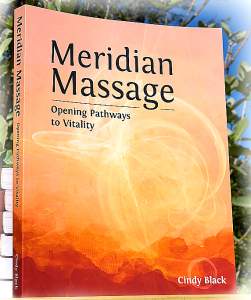 Acupressure is a technique often used within Meridian Massage. Yin and Yang are the two fundamental aspects of all creation: thoughts, material objects, emotions, plants, humans, business enterprises, relationships, everything. For the western mindset, we can think: “two sides of the same coin.” A coin is a single object, yet it is made up of two distinct sides. Without the union of both sides, we would not recognize the coin. This is Yin and Yang. In the course of a twenty four hour day, we have day time (Yang), and night time (Yin). All the moments within this cycle are mixtures of Yin and Yang. Noon is when the Sun is the highest and is the most Yang time of the cycle when compared to midnight, the darkest most Yin time. Notice that Yin and Yang, noon and midnight, are known in relationship to one another. Taken together, the movement and relative relationship of Yin and Yang create the balance of the twenty four hour cycle. Because Yin and Yang are the basis of all creation, Yin and Yang are therefore the basis of human life. Chinese Medicine recognizes Yin and Yang as the elements of Fire and Water. The relative balance of Fire and Water in the body gives rise to the experience of our body temperature, energy, metabolism, sexual desire, moods, appetite, immune function, and more. A simple description of health could be a harmonious balance of Yin and Yang. Any form of massage therapy can support the balance of Yin and Yang. Massage Therapists can easily learn how to add acupressure points into their collection of massage techniques. By combining just five acupressure points, anyone can support the balance of Fire and Water within another, thus supporting their overall well being. Let’s get started. Where is Fire in the human body? The Heart Organ System of Chinese Medicine is associated with the Fire element. The acupressure points used will, therefore, be located on the Heart meridian, which is located on both arms and hands. The acupressure point Heart 7 is located on the palm surface (anterior) of the ulnar (pinky) side of the wrist crease. Where is Water in the human body? The Kidney Organ System of Chinese Medicine is associated with the Water element. The acupressure points used will, therefore, be located on the Kidney meridian, which is located on the abdomen, chest, and both legs and feet. The acupressure point Kidney 3 is located on the medial surface of the ankle between the medial malleolus and the Achilles Tendon. Gently apply pressure to both Kidney 3 and Heart 7 on one side of the body and hold for at least three breaths. Pay attention to the breathing pattern of you and your client while holding these points and imagining Fire and Water coming into balance. After three or more breaths, move to the other side and repeat. Fire and Water centers in the body. Acupressure is an art developed through practice and experience. Apply pressure to your own acupressure points at different intensities using your thumbs and other fingers. Notice the different sensations. Keep practicing and noticing your experience. Also, ask your clients about their experience. Even if you are not fully trained in Shiatsu Massage or Chinese Tui Na, you can gain skill in acupressure by exploring points on your own body first and then trying your technique with clients. Three more acupressure points will complete your Fire and Water balancing. 1. REN 6 (also known as the Conception Vessel) is located about an inch and half below the naval. This area is close to the Urinary Bladder, which is the paired organ with the Kidney. 2. REN 17 is located on the center of the sternum (breast bone) at the level of the fourth rib. This point is located very close to the heart itself and has a powerful effect on calming the heart. Holding these acupressure points at the same time helps the Fire and Water of the body return to a more balanced relationship. Gently apply one or two fingers to these points and hold for at least three breaths. 3. DU 20. While maintaining your contact with REN 6, apply pressure to the acupressure point DU 20 (also known as the Governing Vessel). DU 20 is located at the highest point of the skull, right in the center. Now you are connecting a very strong Yin point (REN 6) to a very strong Yang point (DU 20). Breath, feel your feet grounded into the floor and allow your client’s energy to flow through the acupressure points and meridians, thus balancing the Yin and Yang of their entire body. Relieve anxiety, short temper, stress-induced headaches, insomnia (symptoms of too much Fire and not enough Water). Also, relieve fatigue, lethargy, foggy thinking, apathy (symptoms of too much Water and not enough Fire). Great explanation, Cindy. I could t get the link to work in order to watch your demo. Thanks. Thanks Cindy. These are awesome combinations to use for balancing. I will use them with every massage that I give. They are so simple yet so profound and can easily be taught to clients for their own self care. Yeah! I’m happy to hear that you will be using these points in your sessions. Like so many things, the simpler the better. 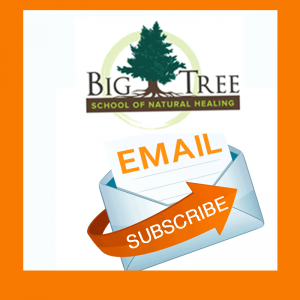 I rarely start following a practitioner who is new to me. But you are different. You give lots of great information in very reasonable periods of time. And it is very usable information! 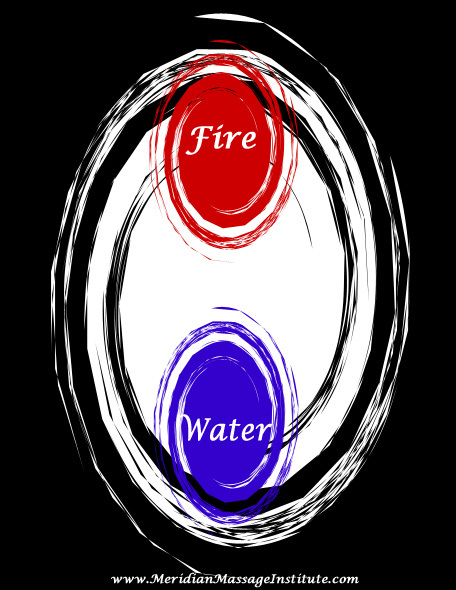 I have recently been having trouble sleeping and I knew that I needed to balance my Fire and Water (I default to Fire/Earth followed by Wood, Water and trailed by Metal in my personal element balance when I have not done some work). For some reason, I supported Water but didn’t bring in HT7. I could tell that adding the Water elements with K3/ Ren6 near bladder helped shift and balance my energy easily and quickly when coupled with Fire points. I often find myself sedating or 3 pointing TW as it seems to be SO active. But pouring Water on the flames is really good for me. Even as a bath, a swim or a friend who has lots of Water. Thanks for the reminder and suggested points! Sorry I rarely have time for online classes and I will miss your Fire/Water Balancing one. May you find great success as you bring wisdom to others. Thank you for your support! And I hope you are on your way to peaceful sleep. What a gorgeous giving soul you are Cindy. Thankyou l appreciate all you share. The way you teach is so clear and infused with your wonderful experience. Thank you so much for sharing this complex knowledge and making it so accessible to non-professionals like me. 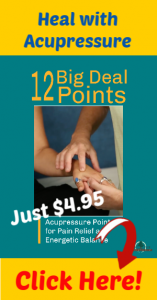 Hi Cindy, Would recommend or do you sell an acupressure point chart? I wish I could find someone who uses your techniques to help me as I can reach some areas on myself, but not others. If someone else with your knowledge could work on me I would probably be able to get over some things that happened to me in my life to put my body out of alignment. I live in Edmonton, AB, Canada and go to Makame College for regular massage therapy. I am retired and living on a small pension so cannot afford much. Being able to work on myself helps immensely. I have been suffering with allergies the last month and am gradually getting over them as well. Thank you for your information and your book which have helped me as I gradually absorb the information. I will ask my Big Tree students if they know of anyone in your area. Thanks for writing – can you tell me which link is not working? I checked the video and it is fine on my end. Thanks for your help!